ST338, or known as AW (Arctic Warfare) Sniper Rifle, is a bolt-action sniper rifle series designed and manufactured by the British company Accuracy International. 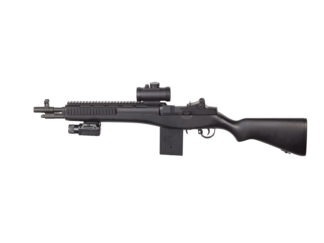 It was popular as a civilian, law enforcement and military sniper rifle since its introduction in the 1980s. 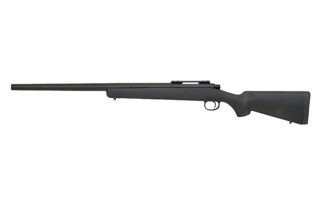 The 338 is the model name of the AW rifles chambered for the .338 Lapua Magnum cartridge. 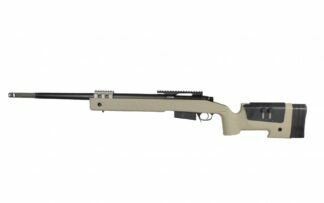 It has been adopted since the first introduction in 1996 by the UK Army (L115A1) and German Army (G22 or Gewehr 22 or Scharfschützengewehr 22 , chambered for the .300 Winchester Magnum Cartridge). Air cocking system which is compatible with Tokyo Marui VSR Series. Aluminum made outer barrel and flash hider. 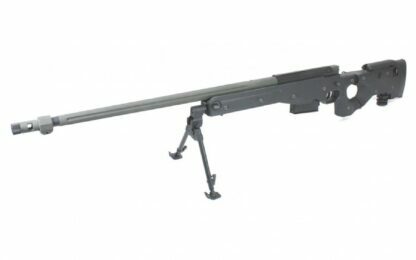 Nylon fiber made Lower body frame with folded rear stock. 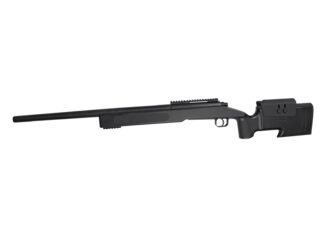 Adjustable cheek piece and monopod can be found on the rear stock. Package comes with a 30mm metal sniping scope mount and a QD bipod.